Comments: The golden eagle is the most abundant eagle in the world and is the largest avian raptor on North America’s western prairies. Its eyesight is estimated to be about 8 times better than that of humans. It often hunts from the air and can make spectacular stoops, or dives, after running prey. Under the best of conditions, it is only capable of flying with prey that weighs about half its own body weight. Pairs will often remain together for many years. If one dies the other will readily accept a new mate. Wild eagles may live over 20 years. 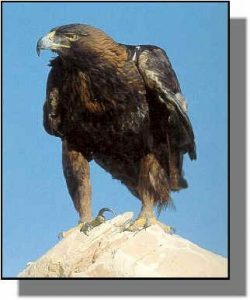 Distribution: The golden eagle is found through the northern hemisphere. In North America it is commonly found in the western states. Although it may be seen statewide it is more commonly encountered in western Kansas. Food: Golden eagles feed primarily on mammals. Favorite prey include jackrabbits, cottontails, prairie dogs and ground squirrels. Occasionally they catch snakes and will also feed on carrion when available.